"Joy. Color. Autonomy. Some of these needs seem to be incompatible with the existence of automobiles." The fragile relationship that exists between bicyclists and motorists on American roadways is no secret. Tolerance between proponents of the two travel methods, in fact, seems to wax and wane with the moon. European cities, by contrast—Copenhagen most notably, as well as many Dutch cities—have been implementing urban infrastructures that meet the needs of riders and drivers and pedestrians for decades. Over the course of three months in early 2008, Boneshaker kept in contact with PDX Bike Militia who agreed to have an ongoing dialogue in which they would “collaboratively answer electronically transported questions.” A patchwork, slightly edited transcript of that conversation follows. Boneshaker Almanac: What, succinctly, would you say is the purpose of the PDX Bike Militia? PDX Bike Militia: To bring joy and safety to all who ask. BA: It's a strong noun you've chosen, "militia." Are you comfortable with and intending all of the implications that come with such a word? PDXBM: The problem with using words, or really symbols of any kind, is that once you put them out in the public sphere you lose control of different interpretations folks will take from them. People have a right to autonomous and decentralized ways to organize community defense and mutual aid. This we are comfortable with. Also to contrast us with other militias, we are firmly anti-racist/fascist. 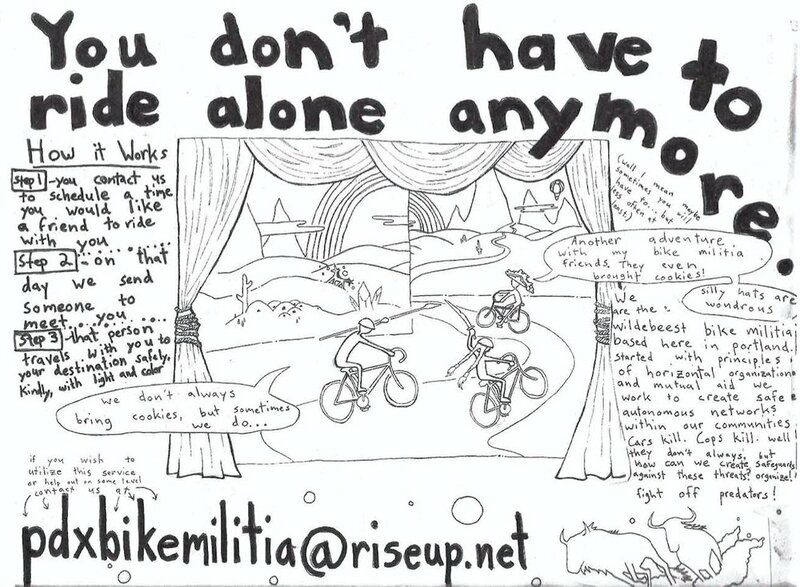 BA: How did the PDX Bike Militia come about? Was there an inciting incident that caused you to unite? PDXBM: It wasn’t one thing in specific. It was a series of incidents that has continued for years: cyclists keep getting killed by cars; poor people keep getting killed by cops; women (and sometimes men) keep getting sexually assaulted on the streets. We don’t know our neighbors. This culture is based on destroying small communities. We are based on the opposite. BA: Can loose affiliations or collectives truly make a noticeable difference in the large-scale safety of a city's cyclists? Have you seen any results thus far in your tenure? PDXBM: For those unfamiliar with Portland, it has a very large legitimate/liberal/mainstream bicycle advocacy community. We as a group were not concerned with making “large-scale” gains, but instead wanted to address a niche missing from the community. Small scale decentralized results. Joy for the individuals. This is what we bring. BA: If you were to pen a sort of bicycling manifesto in which you state the rights and needs and aims of bicycle commuters, what would you include? PDXBM: Joy. Color. Autonomy. Safety. Some of these needs seem to be incompatible with the existence of automobiles. BA: But the hostility between riders and drivers seems inescapable these days and will most likely only increase as cities grow and traffic gets denser. What non-violent tactics are there to ease this polarization? Is it simply unavoidable and part of our culture, or can something be done? PDXBM: As long as cyclists are struck down and killed in the streets there is going to be some bad blood. We as a militia do have separatist leanings, and some would suggest leaving the cities. Only suggestion we can give for improving relations is, smile. BA: There are places far less bicycle-tolerant than Portland. What advice do you have for those wanting to ride, but find it unsafe to do so where they are? PDXBM: Find friends. Ride with friends. Fear no automobile. And when you are getting yelled at on the road, pushed off by some maniac in a car who doesn’t understand why someone would choose to bicycle, remember that you are not alone. We in places far away love and support you for riding. BA: What are your long-range plans and goals as a militia? PDXBM: Bring back the unicorns. With the advent and proliferation of industrial civilization, unicorn (and other “mythical” creature) habitats have suffered profoundly. With the return of the unicorn, the demand for a bicycle militia will cease. As the original guardians of the light are reinstated, we will slowly fade into the lush background and all shall be as it should. This is our goal for our unicorn habitat reclamation project. Members of the militia are leaving Portland and are continuing to organize in affinity with each other in a more rural context. BA: Giving you the last word, what do you want cyclists to think about as they pedal on their way each day? PDXBM: That someday this death-based culture will die. And we will be free to ride bicycles.